A user on the help forums wanted to display a multitab spreadsheet on his Google Site where each tab contains data for a single person. They wanted to have a separate page for each person on their and only display the data for that person from one tab of the spreadsheet on each page. The instructions for how to accomplish this differ slightly depending on whether you are trying to embed a 'New' Google sheet or an 'Old' Google sheet. Embedding 'New' style sheets is more straightforward than embedding 'Old' style sheets. Simply select File>Publish to the Web and select the Embed tab of the dialogue box. Then you can only display that one sheet embedded in the Site. 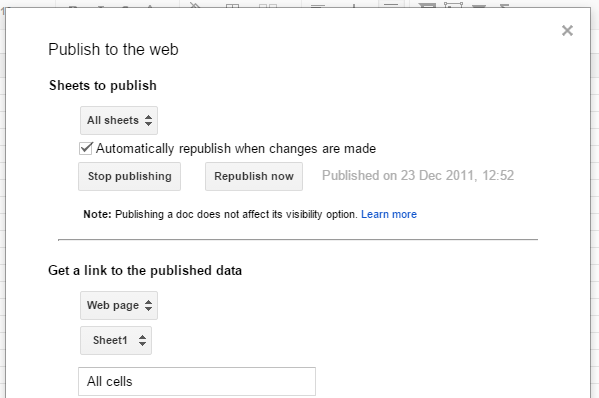 In this instance, what the user needed to do was publish all sheets and get a link to each sheet in turn e.g. and repeat for for each sheet in turn and copy the link generated and embed via the Insert>Spreadsheet option and paste the link into the "paste a web address here:" box.